The IV Therapy Center of NYC offers medical grade IV therapy infusion. IV vitamin and IV supplement infusion therapy is an incredibly effective and painless tool to replenish a patient’s micronutrient and nutritional status. IV therapy initiates a change to the body at a molecular level – meaning it can restore and rejuvenate in a way that is just not possible with vitamins, supplements, or even IV injections. VI (Intravenous) Vitamin Infusion safely and comfortably delivers concentrated natural vitamins, minerals, and amino acids directly to your bloodstream, where they can immediately nourish and rejuvenate your cells and tissue. Everybody can benefit from medical IV therapy vitamin, mineral, and supplement drips. In NYC (especially) most people are under chronic stress, not getting enough sleep or adequate nutrition, and are feeling run-down, tired, have weight loss goals, have anxiety, and/ or are in pain. IV therapy is a great way to address any deficiencies in vitamins or minerals and reach optimal nutrient levels and hydration status. Furthermore, the evidence suggested that IV Therapy could have an impact on the prevention and treatment of more serious health conditions. 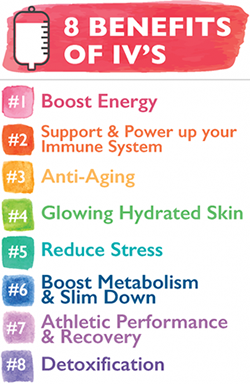 Simply put – vitamins and minerals are necessary for our cells to function properly. By administering the vitamins and minerals directly into the bloodstream via IV therapy, the nutrients (vitamins and supplements) can provide an immediate therapeutic response by correcting any existing deficiencies. When energy levels are high and cells function properly, patients are more likely to recover from acute chronic conditions such as fatigue, depression, asthma and more.